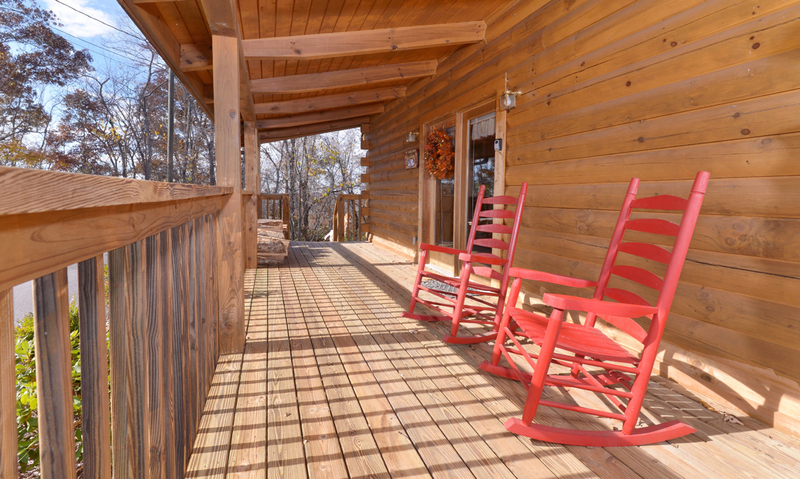 Take the vacation of your dreams to the Great Smoky Mountains and stay at American Eagle. 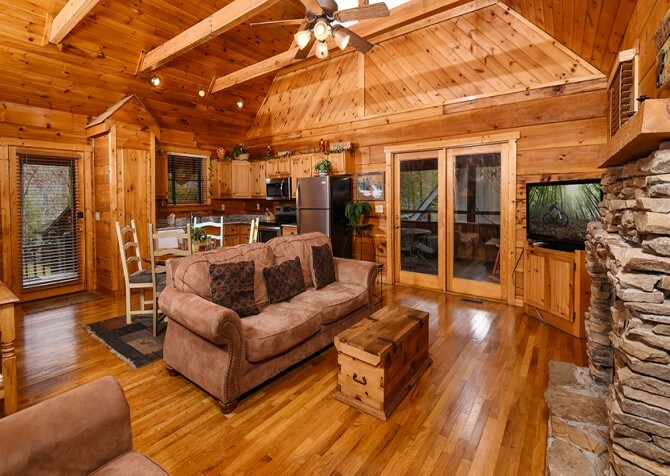 This two bedroom, two bathroom cabin is located in the Eagle Springs Resort in Pigeon Forge, Tennessee. Sleeping up to six guests, this one-story cabin rental offers plenty of space for you and your family on your vacation. With a lovely wooded view and beautiful interiors, American Eagle is a great Smoky Mountain escape for couples, families, and friends. 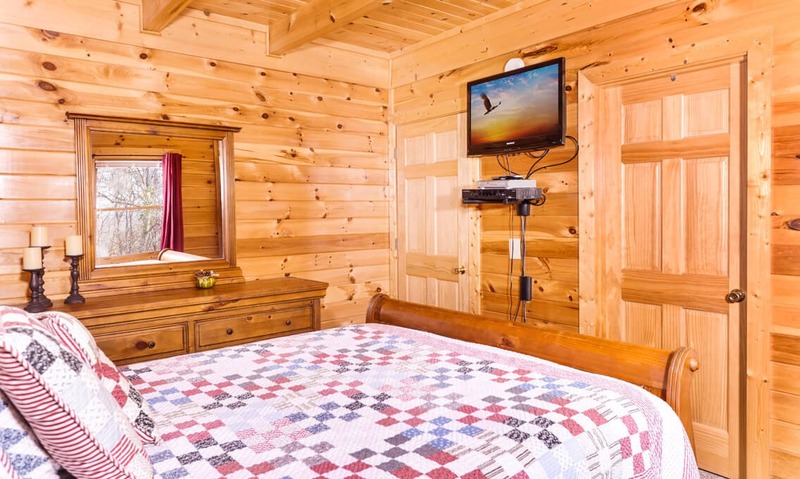 Located a little drive from downtown Pigeon Forge, American Eagle boasts easy access to all of your favorite Pigeon Forge attractions. Spend a day shopping at Pigeon River Crossing or check out the dinner show at the Lumberjack Feud. 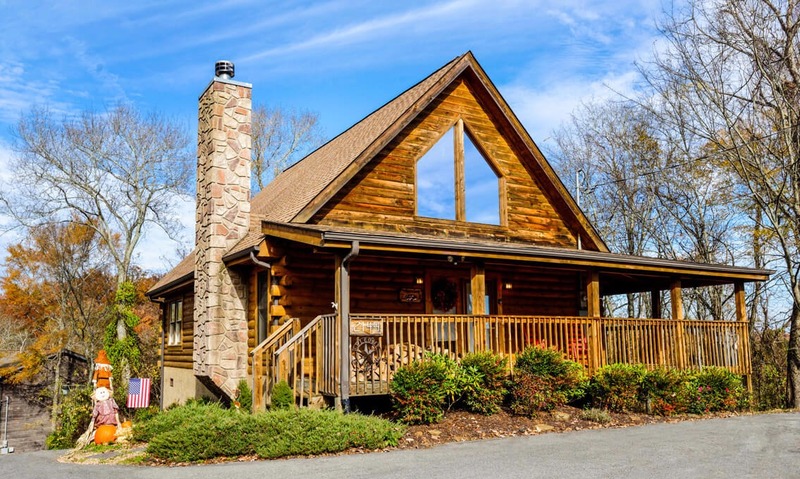 Pigeon Forge is also home to Dollywood and Dollywood's Splash Country, where you'll find rides, shows, and tons of fun for the whole family. The Parkway is lined with many great restaurants – from fast food to elegant steak houses – and there are tons of places to get delicious desserts. Play, shop, and eat as you explore the exciting downtown Parkway. 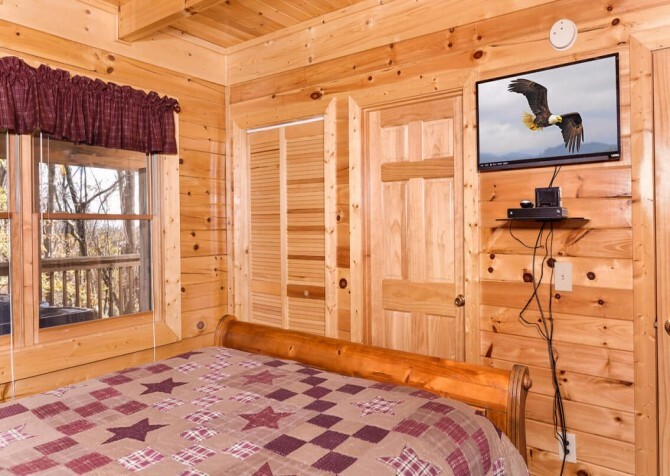 Enjoy your escape from the day-to-day routine when you stay at American Eagle! After a busy day, head back to American Eagle for rest and relaxation. 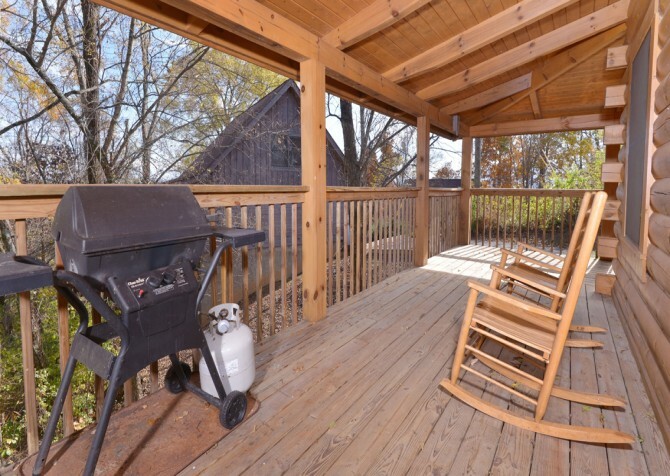 American Eagle offers amenities everyone will enjoy, from the outdoor pool access to a shaded, covered porch. 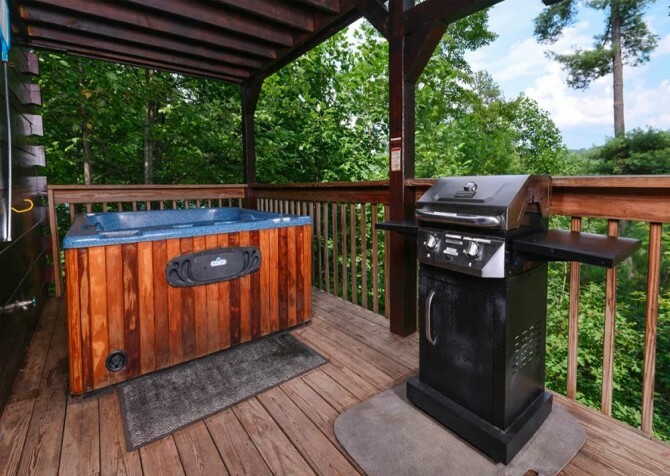 Enjoy taking a dip in the community pool during the summer months, but don’t forget about the hot tub! 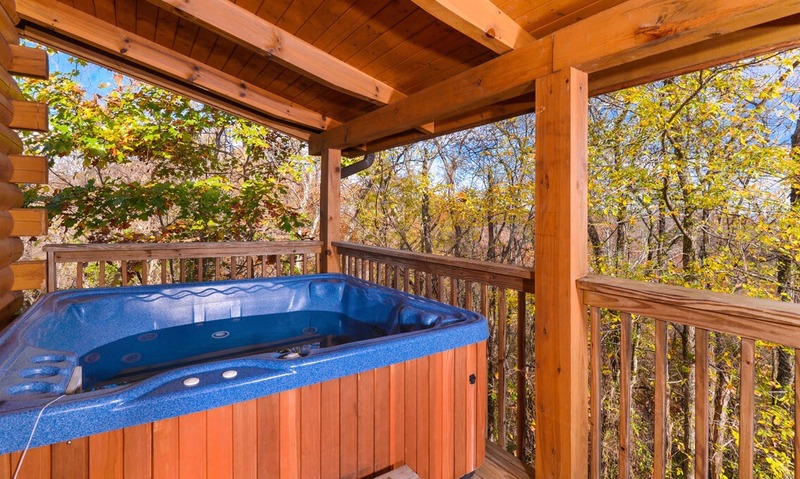 Ideal for a soak no matter the weather outside, your private outdoor hot tub is perfect for soothing your muscles after the long drive into town. 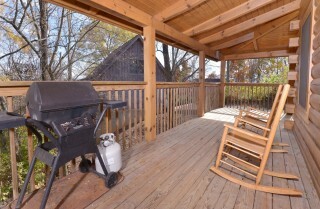 Also on the covered porch are rocking chairs and a gas grill, wonderful for a summertime barbeque. Stop by the grocery store to pick up the food items you need for your vacation – the kitchen of American Eagle already comes fully stocked with all of the utensils you could desire! 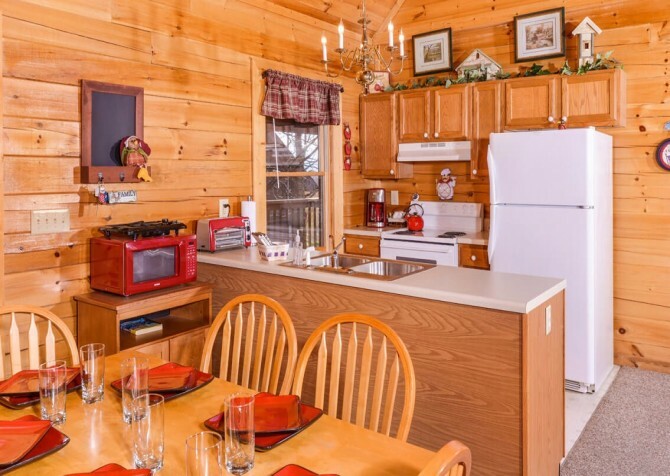 With spacious counter tops, full appliances, and all the mixing bowls and cookie sheets you need, the kitchen of this Pigeon Forge cabin is perfect for those on a lengthy vacation. 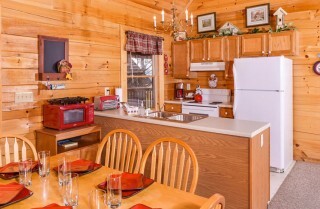 When you don't feel like heading into town and waiting in line at restaurants you can enjoy family meals in the peace of your own cabin. Tired after a long day exploring and shopping in Pigeon Forge? Retire to the bedrooms of American Eagle, which are both furnished with cozy and comfortable queen size beds. Both bedrooms feature TVs and bedside lamps – watch a couple shows or browse the internet on the complimentary wi-fi before drifting off to sleep every evening. 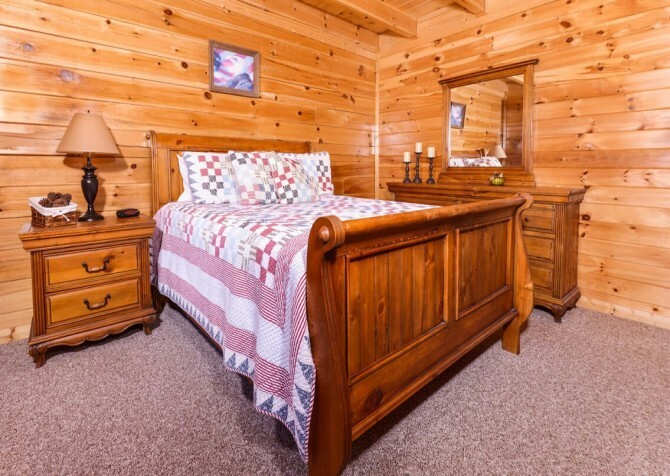 Each will provide a great place to get some much needed rest. 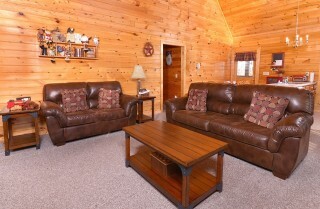 The living area is comfortably furnished and makes an ideal spot for a quiet night in with your friends or family. 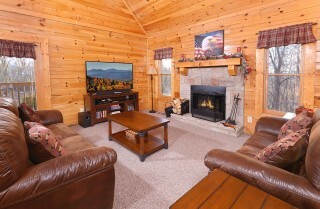 Click on the big screen television and pop in a movie or just enjoy the crackle of the authentic wood-burning fireplace. You will treasure the memories your create in American Eagle for years and years to come. 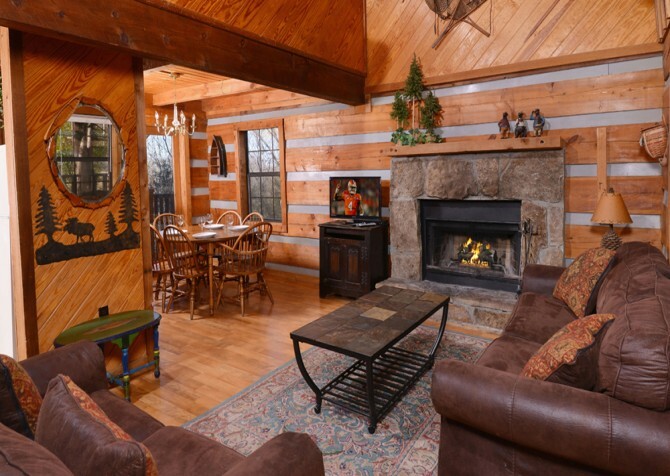 If you're on a honeymoon or romantic getaway, stay cozy by the fireplace and relax. If you're in Pigeon Forge with family, have a movie night or bring along your favorite card games and board games for a family game night! Boasting comfortable interiors, lots of amenities, a great location in Eagle Springs Resort, and a wooded view, this two bedroom cabin is ideal for a small family vacation or a couples' getaway. Interested in reserving American Eagle? 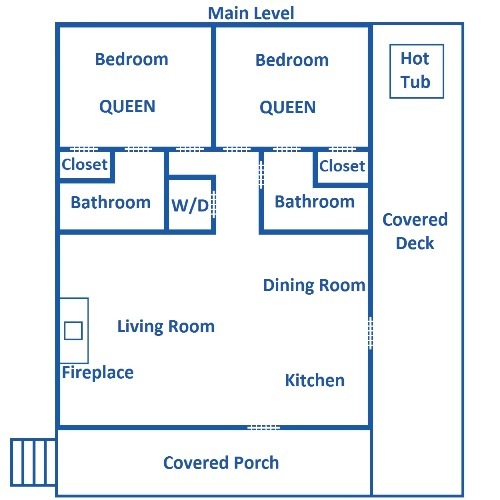 Call us at 1-800-684-7865! "The American Eagle cabin was very nice. 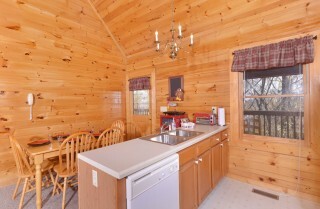 We loved the wood burning fireplace and the hot tub. The cabin was very clean with nice decor throughout. It was very easy to find. 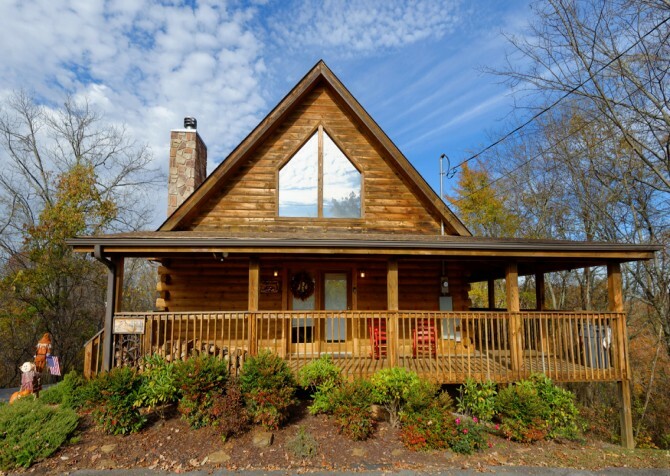 The only thing we did not like was it was a little pricey…"
"The American Eagle cabin was very nice. 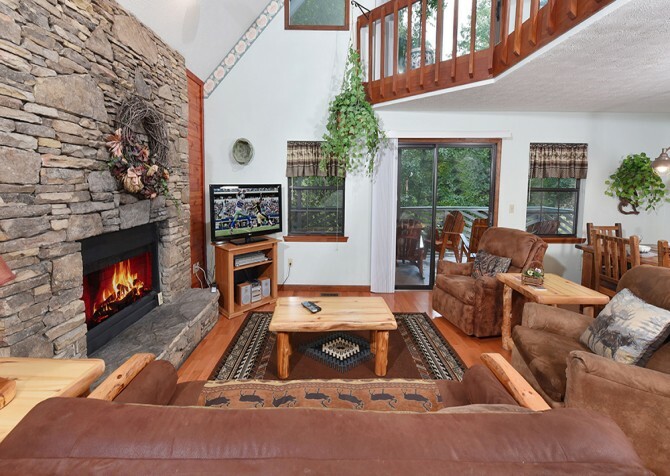 We loved the wood burning fireplace and the hot tub. 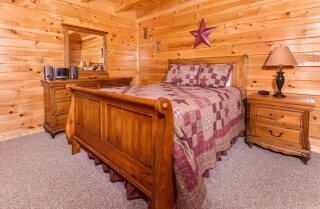 The cabin was very clean with nice decor throughout. It was very easy to find. The only thing we did not like was it was a little pricey and there was another cabin very close to it. Other than that we really enjoyed our stay. 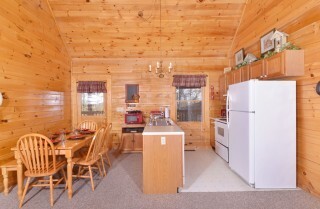 We had no problems with anything during booking or while staying in the cabin. We would recommend using Cabins for You." Thank you for the review! While we are sad to hear proximity of another cabin was not exactly what you wanted, we are so happy to hear the wood-burning fireplace and hot tub was something you loved about this trip! We can not wait to help you plan another Smoky Mountain cabin stay! Indoor Snow Tubing — Year Round!